The contradiction in Frost's "The Road Not Taken" disturbs me--maybe too much. The speaker spends a good amount of time--my time, as reader--establishing that both paths "equally lay" & were "about the same." I'm familiar with the poet's subtle irony, autobiographical references, literary allusions yadda yadda yadda--but these hardly justify the colossal gaffe. Those who defend the poem on the aforementioned grounds no doubt belong to the same group who find the poem comical. Comical? I've never heard one person as much as snicker unless I read it in my dumb guy voice. Now that's funny! Know another thing that bothers me? Frost once claimed that he intended his poetry to be interpreted only literally. Not only literally, but also . . . but only literally! If true, then what about the last stanza of the poem? Is the speaker so boring that he'll tell "ages hence" the tale of his choosing one path over the other while taking his constitutional? Gee, um--great story, Gramps. It reminds me of years ago when my dad, after a few too many, interrupted my studying for midterms so he could tell me in excruciating detail about his experience of buying a hat. The story--or the hat, for that matter--didn't have a point, but that didn't stop him from retelling it. Repeatedly. The poem's ending really irks me. How does the choice of one leafy path over another make "all the difference"? Obviously, the poem means to transcend a walk in the woods; without delving into nuances, simply put, the poem is about life choices. There walked the one whom I would wed.
And killed twelve nuns, so the news said. This new stanza resolves the contradiction: 12 people traveled the first path while one person took the road "less traveled by." I needn't explain how it supports the assertion that the choice of roads "made all the difference." That seems painfully clear. Moreover, the new stanza doesn't detract from the thought that one needs to follow his/her own path in life. If anything, it reinforces the idea by showing decisions have consequences. As a manly man & writer of free verse, I'm unconcerned with how my poems scan on the whole. However, as standard practice, I'll don my work clothes now & again, button up the oil-stained shirt with my name in script above the pocket & go line to line, checking meter in order to understand the rhythm & to create perhaps more interesting patterns. I should probably do this more often, but it's understandable why I don't. Years ago, performing routine scansion on a parody of Yeats ("Leda & the Sun," which appeared in the now defunct Great Midwestern Journal) I suffered an extremely painful stress fracture. My foot, broken in two places, but mostly in iambic pentameter, required a clunky boot. Something new from Kenneth Cole? I also needed a cane, which--to put a positive spin on otherwise regrettable circumstances--helped me solve the riddle of the Sphinx. By the way, great punchline, Sophocles! Once while composing a crown of sonnets, I tore ligaments in my pinkie. Initially, I thought it a minor injury & treated it as such with ice & ibuprofen. However, when the area around the lower knuckle remained sore & swollen long after the publication of "Part of the Problem" (New Zoo Poetry Review), I consulted a prosody specialist, who suggested mythosurgery, with the caveat that the fateful finger would never completely heal. To this day, though not quite the proverbial sore thumb, my pinkie juts slightly outward & sidewise, as if I were forever having tea & crumpets with the Queen. It's like a string around my finger to remind me of the toil & trouble, times two, that went into the making of this crown. To laundry-list a few other ailments, I scratched my cornea while completing "Blind Spot" (Georgetown Review), suffered whiplash during "Washington Crossing the Delaware" (Swink), dislocated a finger via a hard enjambment in "Here's How" (ABZ Review), developed hypertension, which had something to do with "Scenes from a Sonata" (Hunger Mountain), aggravated allergies while researching "Night at the Improv, C. 1600" (Segue) & broke my little toe when I fell down the stairs proofing "Ars Poetica" (DMQ Review). Too often, the general public envisions poets as innately frail, sickly creatures who bemoan their existence for lack of love or who wax poetic over the imcomprehensible beauty of a petunia. But that's backward. It's not that poets are weak by nature, but rather, that poetry is a deceptively dangerous field, beset with infinite risks. Prolonged practice of this sullen craft eventually erodes the poets' health until they can barely lift their quivering quills, so to speak--which is to say nothing of the emotional toll, though, in retrospect, maybe I should have. If you were me, you'd find many people share your name, most notably the once promising MLB pitcher whose career tanked & a former Mickey Mouse Club member who's a musician. Allegedly. In either case, I'm not likely to be confused with those guys. From time to time, I receive phone calls for locals also named Matt Morris, but despite the inconvenience & annoyance, it's simply mistaken identity that, for the most part, is easily rectified. After all, we're not in the same line of work or know the same people. 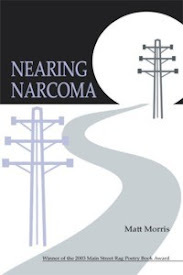 However, thanks to Google & narcissism, I've learned others named Matt Morris are credited with writing poetry. As a disclaimer, let me say I'm not this guy. Nor this. Certainly not this either. Listen, Matts, you need to be with me on this one. For the common good, ok? I'm sure lots of people have the initials H.D., but they all don't sign their poems that way. Even if every atom belonging to him as good as belongs to me, I don't call myself Walt Whitman. It would cause confusion, not to mention make me appear totally wacko. Thus, in order to prevent utter chaos, we need to agree that only one of us can write as Matt Morris. Here's the deal: Since my first book was published in 2003, my first poem way, way, way back in the f'ing '70s, I have first refusal on the name--& yes, thank you, I'm keeping it, my name. You Mattys-come-lately can battle it out over who gets to use Matthew, I suppose. Or how about you lesser Matts using initials? Or why not take a tip from the e-world & add numbers to your name? Better yet, ever consider a nom de plume? 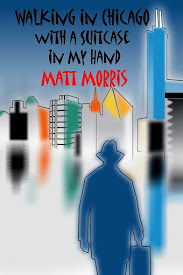 Point is, there's room for only one Matt Morris in poetry town & that position is filled. You! Hypocrite lecteurs! Quietly & quickly move away from the name. It's taken.